Don't ask me to try and pronounce this one! 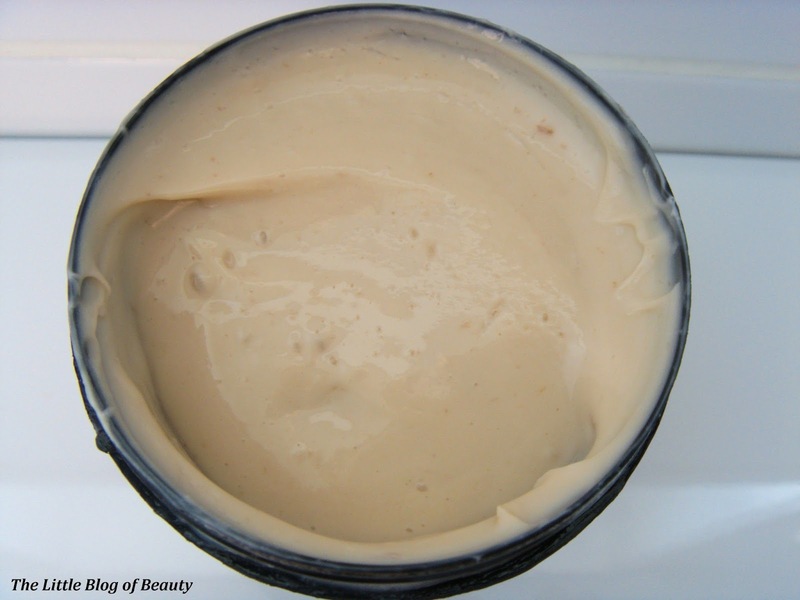 Several years ago I used to Lush's Marilyn and I loved it. I'd cover my hair in it, wrap it up in a towel and leave it for as long as possible and then wash it off in the shower before shampooing as usual. The only reason I stopped using this was because Marilyn is for blonde hair, so when I dyed my naturally blonde hair dark chocolate brown a blonde hair product was no longer any good for me. I wanted a similar product (that you apply and leave on before washing) for brunette hair, but as far as I could see Lush didn't do one. Last week I wanted to place a Lush order so I had a quick look at the hair treatments again and found H'suan Wen Hua, which is the same as Marilyn but not specifically for blonde hair. I'm not sure if this is a reasonably new product (well within the last few years) or if I just didn't notice this when I looked before, but I was really pleased to find this. 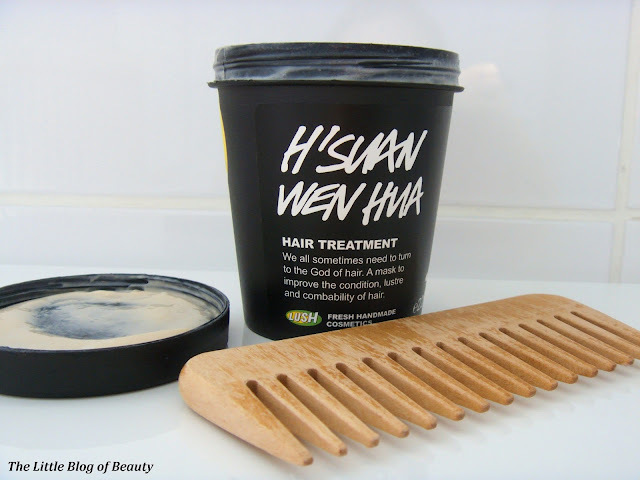 My hair is not in particularly bad condition, in fact it's actually in very good condition, but I still like to apply a treatment like this every so often to try and keep it in good condition and make it really soft and smooth. 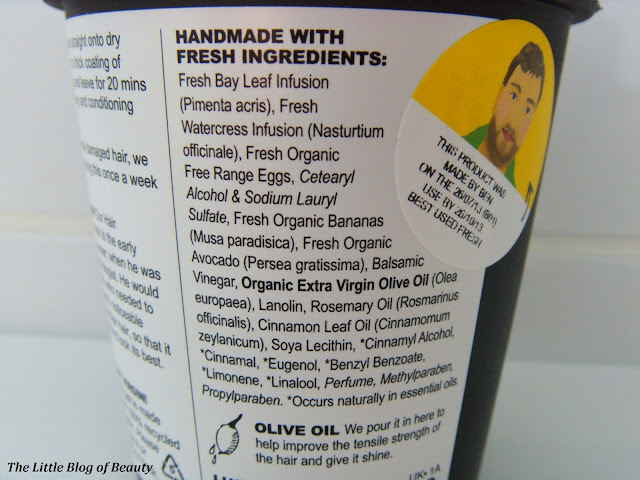 Lush are all about fresh natural ingredients and this contains fresh organic free range eggs, bananas, avocado, balsamic vinegar, extra virgin olive oil and rosemary oil. This one is vegetarian but obviously not vegan because of the eggs. 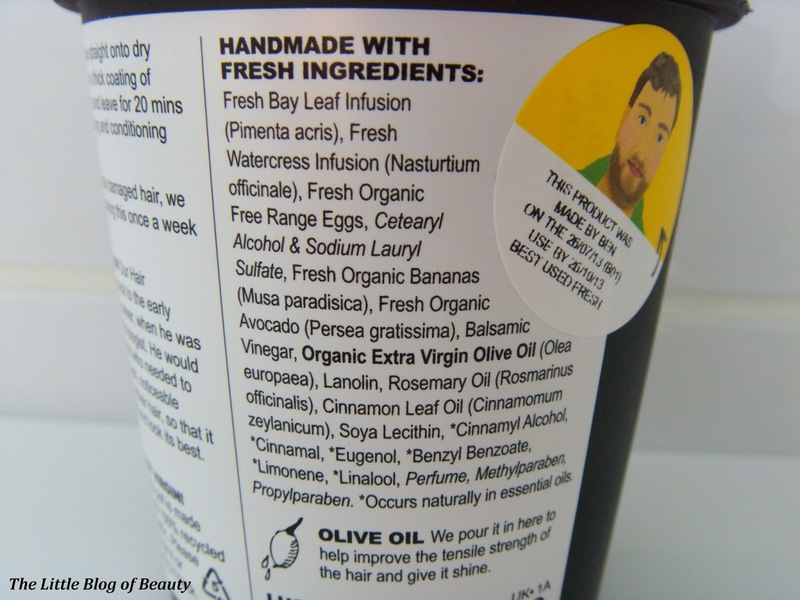 Lush put stickers on all of their products telling you when it was made and when it should be used by and this has a use by date of 26/10/13. However, I often use Lush products past their use by date, normally until I see the product starting to change. Many of Lush's products smell very strong and in fact I don't very often actually go into the stores because I find the smell too overpowering. Unfortunately I really don't like the smell of this, but I'm willing to live with it! I'm not entirely sure what the smell is but I think it may be cinnamon. As I used to do with Marilyn I applied some to my hair, wrapped it up in a towel and left it on for maybe a couple of hours before rinsing and shampooing. 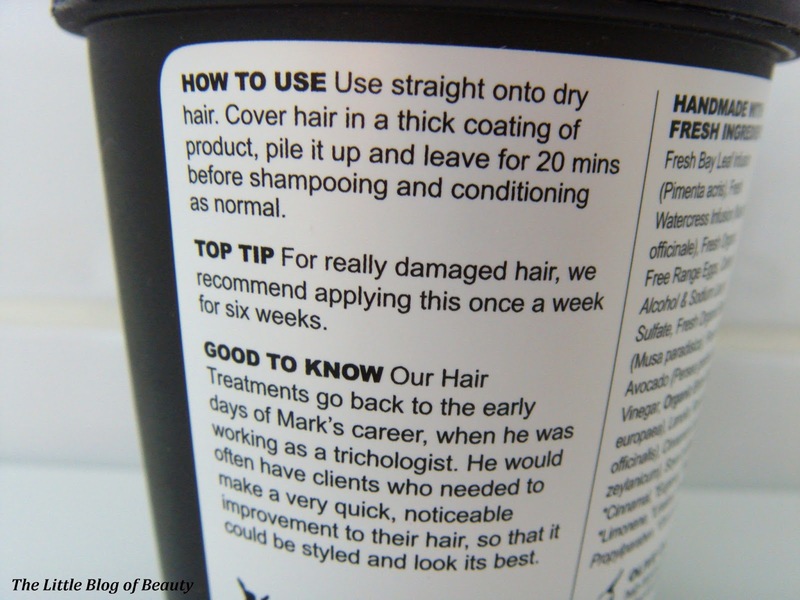 Once dry my hair felt amazing, so soft and smooth with a lovely shine and my straighteners glided through my hair really easily. The only thing I'm not really keen on is that once rinsed out you can still smell this on your hair and I could even still smell this faintly two washes later. The only reason I'm not keen on this is because as I said I don't like the smell, but if I did like the smell this would be amazing! 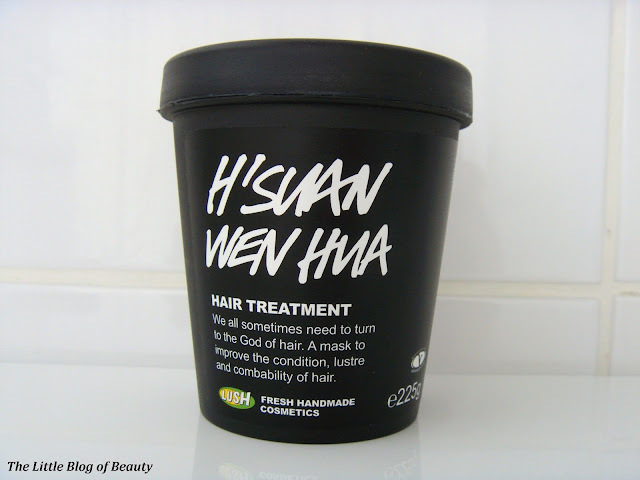 This is £8.95 for 225g which is quite reasonable for a Lush product. 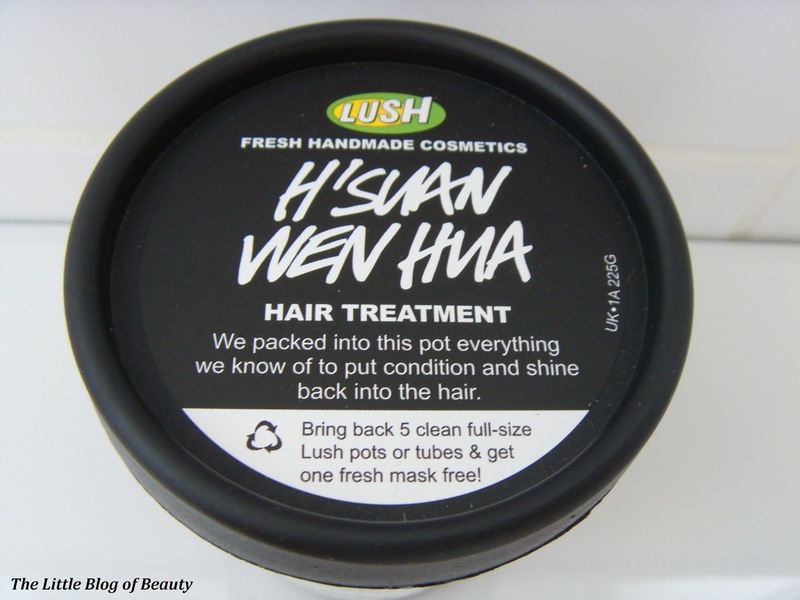 I noticed on the Lush website that people said they got two treatments from one pot but I only used around a fifth of the pot and I have shoulder length hair so I think you could make it last longer than that. I'd definitely recommend giving this a try!